“Monsters University” opens in theaters tomorrow! I can’t imagine it, but just in case you’ve missed the buzz about the new Disney-Pixar movie, here’s the story… Ever since college-bound Mike Wazowski was a little monster, he has dreamed of becoming a Scarer-and he knows better than anyone that the best Scarers come from Monsters University (MU). But during his first semester at MU, Mike’s plans are derailed when he crosses paths with hotshot James P. Sullivan, “Sulley”, a natural-born Scarer. The pair’s out-of-control competitive spirit gets them both kicked out of the University’s elite Scare Program. To make matters worse, they realize they will have to work together, along with an odd bunch of misfit monsters, if they ever hope to make things right. 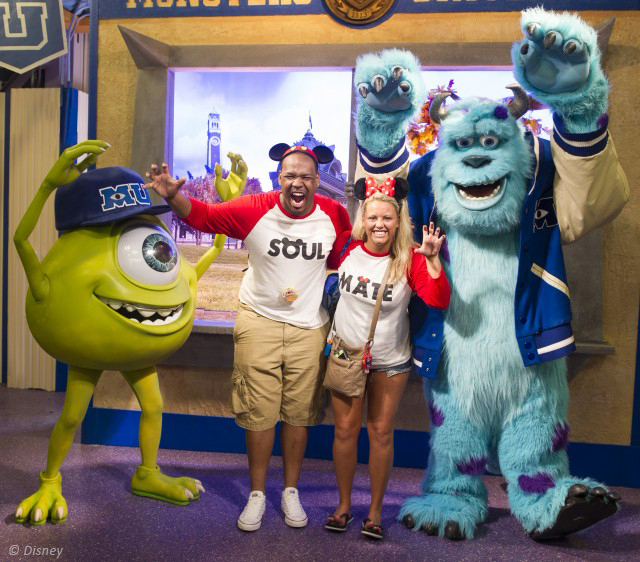 This summer, Mike and Sulley drop in from MU to scare up monstrous fun for Walt Disney World Resort guests. Meet the dynamic duo and pose for photographs at the Monsters University Student Union on the Backlot at Disney’s Hollywood Studios. Show us your best monster face! Share your photos taken with Mike and Sulley on our facebook page and let us all know what you think of the new movie. 2 thoughts on "Meet Mike and Sulley at Disney’s Hollywood Studios"
How long will Mike & Sully be on the Backlot at Disney’s Hollywood Studios? We are going in Feb. 2014, and my nephew would just flip out to see them!